"Raindrops" by the Inspirations is an old favorite of R&B collectors recorded on February 25, 1956 at Beltone studios in New York. 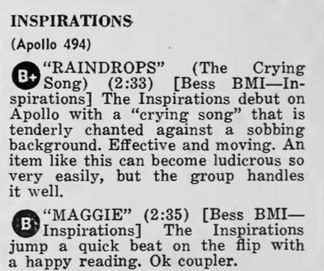 "Raindrop","Maggie" and "Pretty Mama" were all recorde one afternoon in a memorable session that also spotlighted the Keynotes and Vocaltones.Apollo usually rejected the teenage street corner vocal group in favor of more polished older singer, but by the winter of 1956, they needed younger local groups to compete with strong NYC labels like Rama and Old Town. 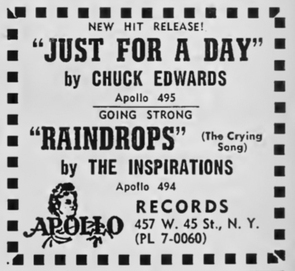 The Inspirations Crying lead can't quite reach the heights of Jackie & the Starlites later "Valarie", but his pipes got quite a workout that day on "Teardrops" ("The Crying Song") . "Maggie" was the flip, released as apollo #494 to good NY airplay in March 1956. Members of the group were William Perkins, Burnett Lengester, Willie Wiggins, Joe Warren, Felix Hunt and Harry Dixon.